The Kinderfeets Push Bike, Dutch by design, SMB by size of firm. This amazing little push bike brings children back to simpler times, times when SMB owners were children. Its not hard to remember back to the days of the tricycle... remember how unstable that cycle was. This new bike makes more sense to me. Immediately it places the child in a bicycle position with 4 contact points, two wheels and two feet. The bike is an excellent first step in bike riding. Bike riding should be encouraged as a great form of exercise that you can do nearly your entire life. When you add culture to the mix, you get a product that becomes educational as well as physical. This is all the brain child of Netherlands native, Oscar Mulder. Mr. Mulder's background is in package design and identity branding. With over 20 years experience in running his SMB, Mulder's experience has rewarded him with contracts from Carl'e Jr., Hand-Scooped and Ben & Jerry's. Named after the Dutch word "kinderfiets" which means "child's bike", Kinderfeets is a new push bike -- a small training bicycle without pedals that allows children's feet to touch the ground. Dedicated to encouraging children and their families to live an active, creative, and adventurous lifestyle, the award-winning push bike is eco-friendly and features a newly patented design. Mulder's passion for bicycling stems from his Dutch heritage and his lineage; his Great-grandfather was a bike designer, inventor, and bike shop owner in Amsterdam during the early 1900's. Continuing his family's bicycling legacy, Mulder started his son on a push bike at the age of two. Disappointed by the push bikes they tried, the second-generation bike builder took it upon himself to design one that met his son's needs. 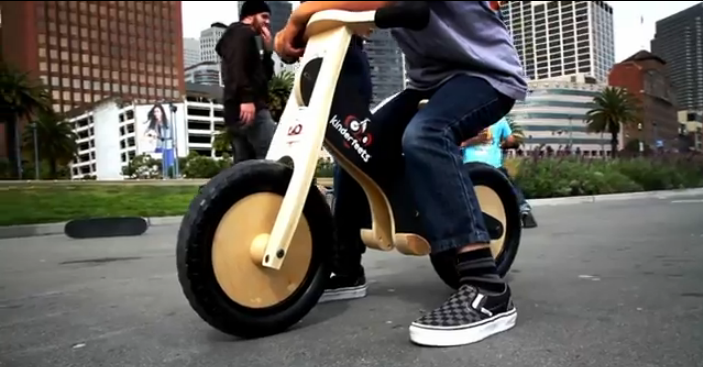 "My son learned quickly and safely on the bike I designed, and he enjoyed doing it," states Mulder, creator of Kinderfeets. "I wanted to share the same positive learning experience we had with other families and that is how Kinderfeets was born." Kinderfeets (TM) is designed for ages two and older (maximum weight load is 65 lbs. ), and is available in six different chalkboard color finishes (yellow, green, pink, black, red, and blue) that retail for $110 -- a natural finish is available for $100. For every 50 Kinderfeets' sold, one will be donated to the Marine Toys for Tots Foundation. The national website is the starting point to find one of our 730 (2011) Toys for Tots campaign sites. At the top of the Home Page (www.toysfortots.org), there is a dropdown menu labeled “Select a State”. From this menu, one may select the state, then the city/county in which they reside. If the city/county is covered, clicking on that location will take the surfer to a local Toys for Tots website. At the local website, each visitor may find information about local events, how to become a collection point for the local campaign, how to register for assistance, and how to donate directly to a local campaign. Visit Kinderfeets.com to order, to learn more, or to become a Kinderfeets distributor or dealer.